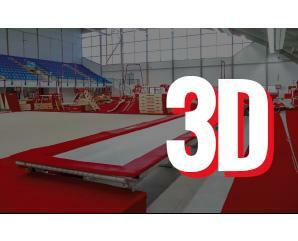 This new teaching module helps gymnasts (up to 1.60 m tall) to perform back flips and handsprings in complete safety. Due to its unique shape, the module returns to its initial position after each use and provides proper support for the gymnast throughout each movement. 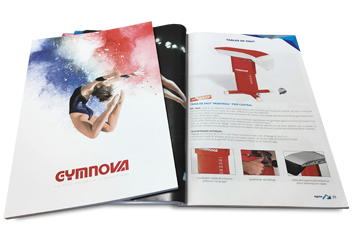 It has the special feature of automatically rotating when the gymnast's basic jump movements are correct (transfer of bodyweight to the rear). It enables controlled rotation and provides optimal support while encouraging good flight. With the use of the stabiliser Ref. 0356 (sold separately), the Rockin'Gym converts into a mini-vaulting table for teaching the basics of front giants. Two-tone module constructed of polyurethane foam and a 1,000 denier phthalate free PVC cover with class M2 fire rating. Module with fully removable cover and 2 carrying handles for easy transportation and quick set-up. - For gymnasts up to 1.60 m tall. - Dim. = 100 x 70 x 87 cm (Lxwxh). - Weight = 16 kg.